Frankie & Benny's is a place where we have enjoyed dining at several times over the past few years. It has a large menu with dishes to suit most tastes and a lovely relaxed atmosphere; it's somewhere you can take young children and enjoy a family meal comfortably with reasonable prices. We were pleased to be invited back recently to try the updated menu and I quickly set a time and date for our booking, as I was eager for a night away from the kitchen (and dishwasher) and some delicious food. We arrived before our allocated slot and we were shown to the bar for a drink as our table wasn't quite ready. I opted for a cocktail (I do like to make the most of a meal out) whereas the Mini Mes had the fruity non alcoholic versions and the Mr a soft drink. By the time our drinks were prepared we were able to be seated which was ideal. Our waiter was lovely. Very friendly and helpful and he engaged with us all. I did wonder if he was being particularly nice as he knew that we were there for a review but I observed him tending to others and he just seemed like a genuinely nice guy. A big thumbs up for the service. He offered to bring over some Double Dip Dough Balls for our hungry tums while we browsed the menu, so we all tucked into those while picking out our courses. They were warm and soft with pleasant dips; garlic butter and cheese. I was quite tempted to request a second plate but I didn't want to appear greedy knowing that I would most definitely be indulging with dessert too! 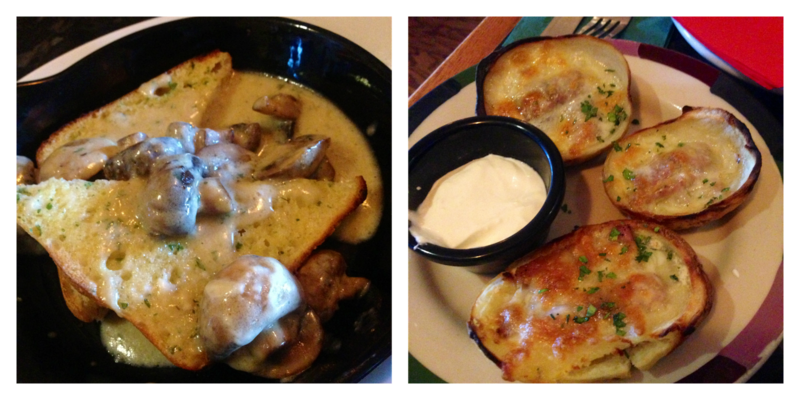 The Mr selected the garlic and cheese mushrooms (garlic button mushrooms tossed in a rich cheese sauce, served over toasted garlic ciabatta bread) and I chose the Amazing Skins For One with cheese and bacon (three, mouth-watering and fully loaded potato skins. Served with sour cream on the side) for starters. Both of these were lovely although I felt the potatoes were a little dry. Knowing how large the children's main portions are, and having eaten the majority of the dough balls already, the Mini Mes decided to simply order the Ribs, Chips and Salad from the Juniors menu (a half rack of pork ribs glazed with BBQ sauce and served with fries, mashed potato or a jacket, mixed salad and a pot of extra BBQ sauce on the side) which is their favourite! For our mains the Mr and I opted for pasta dishes as we do like our carbs, and while the Mr had the Smoked Salmon I went for something with a little heat; the Chicken and Chorizo. We were offered condiments and I took advantage of the Parmesan... my diet is going really well as you can tell! The ingredients were all vibrant and looked really fresh. The pasta was cooked so it still had some bite which is just how I like it and the Mr said his salmon was perfect. Despite being reasonably full already the pudding menu was far too tempting and we all selected one to try. I chose the Chocolate Fudge Brownie Sundae and I asked if they could adapt this for me by changing the vanilla ice cream to mint choc chip and they were more than happy to do so. The Mr selected the Warm Apple Pie which smelt incredible and the Mini Mes went for a smaller version of my own and the Chocolate Honeycomb Waffle which was served with lashings of sauce and ice cream. Perfect for a sweet tooth - there were clear plates all round. We were served really quickly despite the restaurant being busy and the space between courses was short although it still allowed the Mini mes time to complete their free activity packs. Food was hot and we were all satisfied with the flavour of each dish. Portions were very generous, especially for children which I felt were perhaps a little too big for them, although it was nice to see plenty of salad. I would certainly return and I would also recommend Frankie & Benny's to others as we had a another great evening there. There is organic baby food available for tiny ones, a kids menu with mains, desserts and refillable drinks available from just £4.25 plus a junior menu offering lots of variety. There is also a gluten free menu which was great to hear. 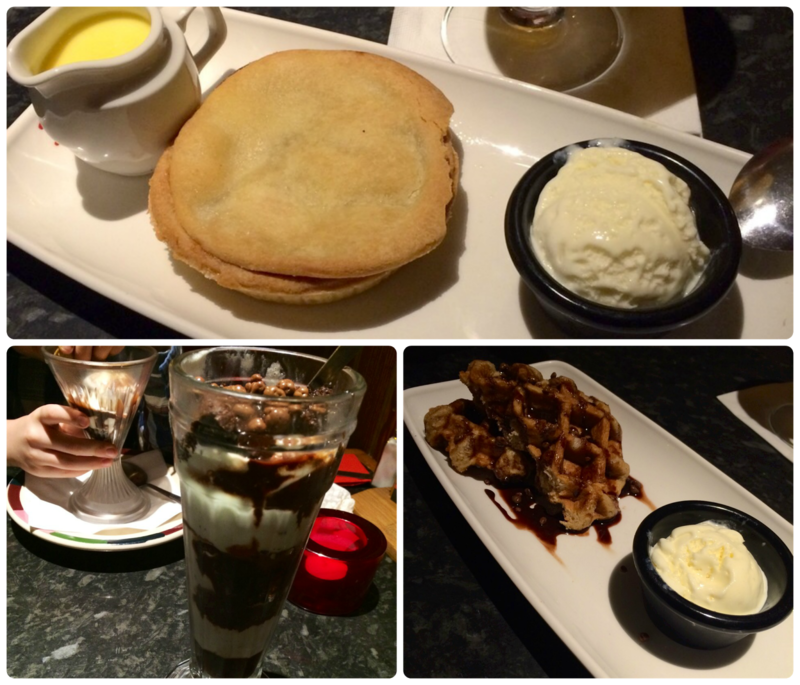 Have you been to Frankie & Benny's recently? We haven't been for ages. It's one of the only places we will take our son as he has autism and eating out is a struggle for him but at Frankie and Benny's we know they are family friendly and we can wedge him in a booth seat :) Love the food.